By God’s grace, I composed and illustrated this poem to encourage you to, as the title says, trust in God. This is not something that can be done in a vacuum. You need to know what God has made available to you in His word, what the Bible often calls your “inheritance in Christ”. Then as you believe, you see it manifested in your life. And this is not a one-off thing. It’s something you do continuously. When you internalise this, temptations that come your way will find you stronger than they are. You will resist and overcome. You will remain in right standing with God and reap other benefits of your salvation like healing, deliverance and guidance. 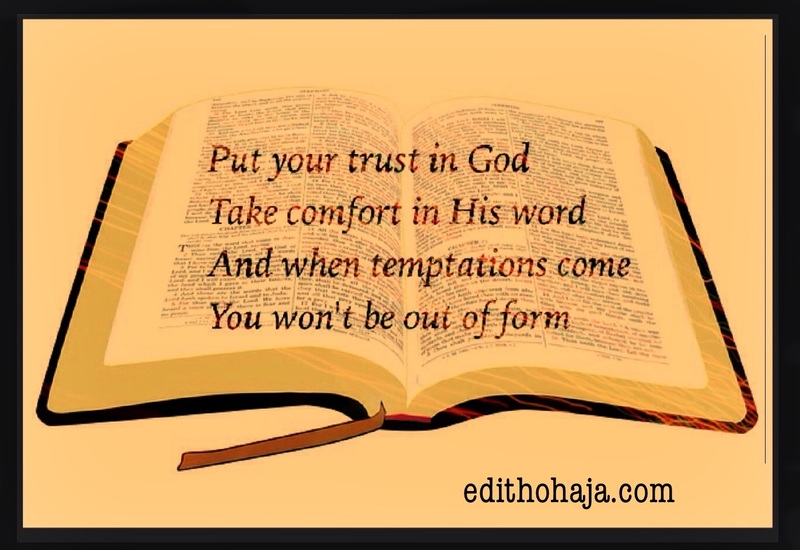 But it all comes through constant intake of God’s word and trusting Him to do as the word says. And He will! Yes, and as we feed on the word of God, the grace and truth we need to overcome fill our hearts. You are bkessed! There is no other way to be happy in Jesus but to trust and obey. ‘One of those promises in God’s word is the grace to overcome evil.’ God would always be there to help us overcome evil as long as we keep him close to heart and follows his footpath. All the great men and women in the Bible exhibited such trust in God even when it's so clear that the chances of getting the miracles done where at the 0% but they knew the secret of getting an answer from God which is trust. In our world today all we care about is the qucik response that we could get from God without knowing if for a truth that's what he also wants for us and when the response are not forth coming we tend to deviate from God's plans and purpose for our lives. Thank you for this article ma, it's a great reminder that trusting God is not a one-off thing rather a continuous process. One with God is majority. Trusting HIM to help us in our times of need is Must. We have no choice. When trouble comes God sees and knows and he helps us . Having matured to this age I can categorically say that life is spiritual and without God I wouldn't be here today. I TRUST HIM WITH ALL MY HEART AND HE HAS NEVER FAILED ME AND NEVER WILL. .
Having knowledge of the inheritance which we have Christ Jesus, all we have to do is to trust and obey his word.